Dense virgin rainforest, granite outcrops, spectacular islands with pure white sand beaches, secluded coves, pristine waters, mysterious ship wrecks, and colourful coral gardens, all help create a variety of environments that nurture an amazing array of endemic species, from the smallest frog to the heaviest land tortoise and an abundance of nesting seabirds. The 115 islands in the archipelago of the Seychelles are a virtual living museum of natural history and a sanctuary to some of the rarest species of flora and fauna on earth. The tropical, crystal clear waters that lap against the white powder beaches are teeming with an abundance of life from the smallest of critters to the largest, the Whale Shark. Come with us on an intimate journey through the breath-taking natural beauty of the Seychelles islands. Start your journey at the most scenic and famous of the granitic inner islands - Praslin, La Digue and Silhouette. In Praslin enjoy the timeless beauty of the forest of the Valle de Mai, a ‘slice of Eden’ and UNESCO world heritage site, with its endemic Coco de Mer palms. 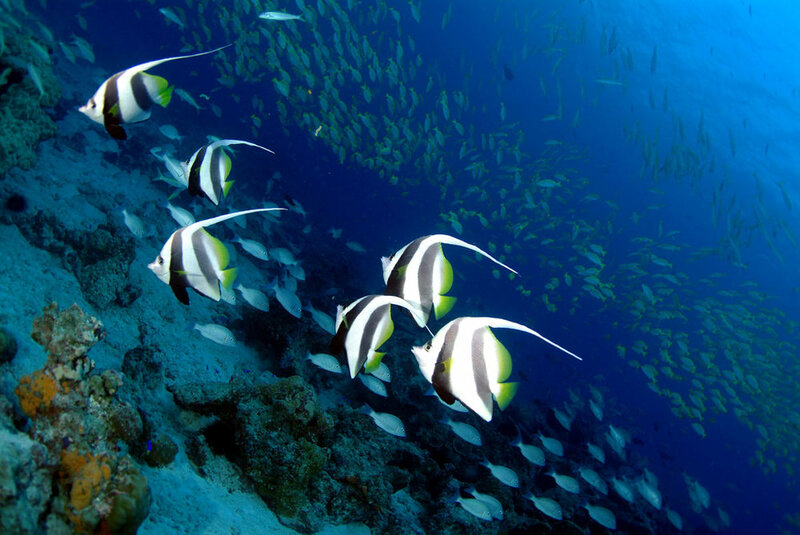 Over 50% of the land mass of the Seychelles is national parks and protected areas. Enjoy the characteristic smooth granite rocks and white sandy beaches of La Digue; and walk through the virgin rainforest full of rare hardwoods, exotic orchids and carnivorous pitcher-plants on Silhouette, the 3rd largest of the Granitic islands. For unrivalled access to the more remote inner islands what better way than by privately chartered yacht. Spend seven incredible days exploring the more remote Granitic and coralline inner islands of the Seychelles Archipelago. Experience a wide variety of reef and marine life including reef sharks, stingrays, batfish, lobsters, octopus, barracuda and turtles. Discover natural marine reserves, with huge boulders, dramatic vertical walls, underwater mazes and swim-throughs unique to the Seychelles. Walk through significant island nature reserves filled with unique flora and birdlife and see the Giant Tortoises roaming freely. Our private charter allows you to experience first-hand the underwater riches and unique wildlife that make the Seychelles so special. Sail through the paradise islands onboard our exclusively chartered yacht limited to 12 guests only. Visit virgin rainforest, granite outcrops, spectacular islands and secluded coves. Immerse yourself in the bountiful wildlife of remote islands and national parks. 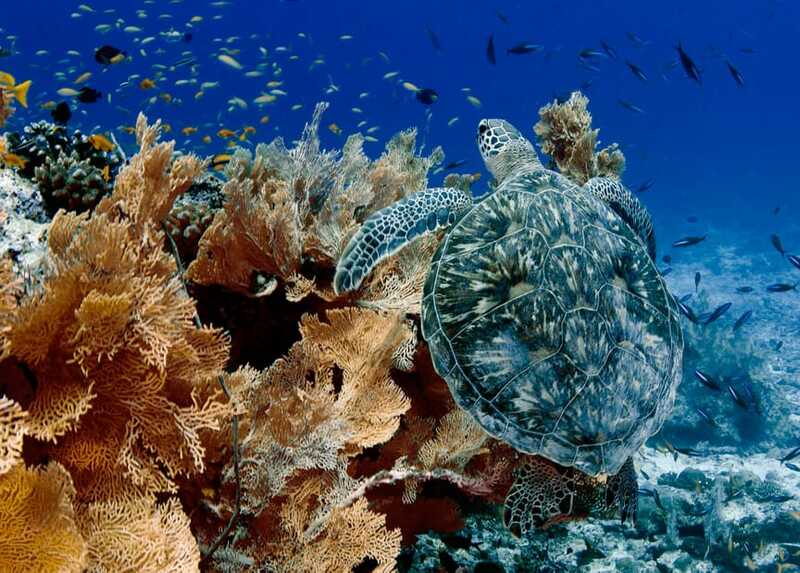 Enjoy the crystal-clear waters and rich marine life. 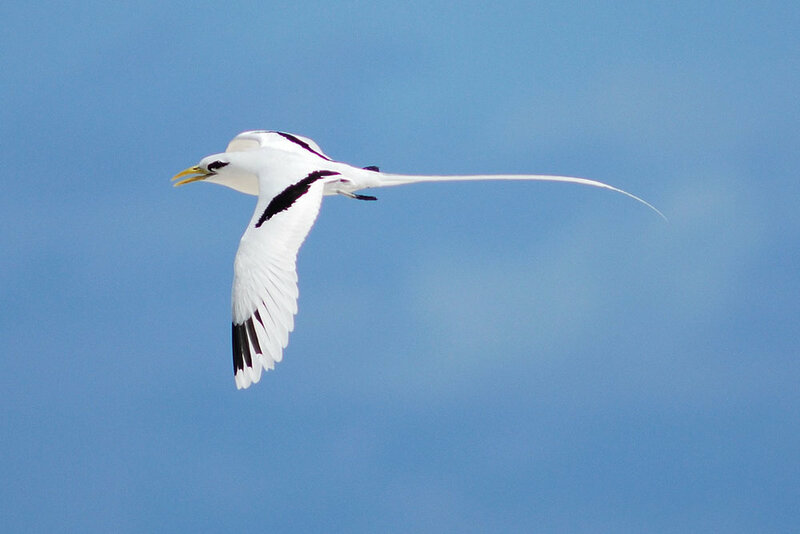 Walk along pristine white-sand beaches and see the many nesting seabirds. 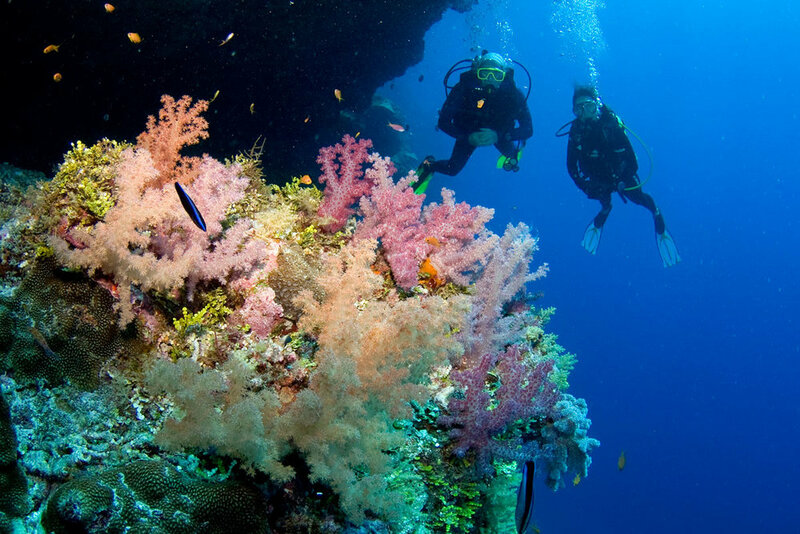 Dive and snorkel marine reserves with huge boulders, dramatic walls and coral reefs. 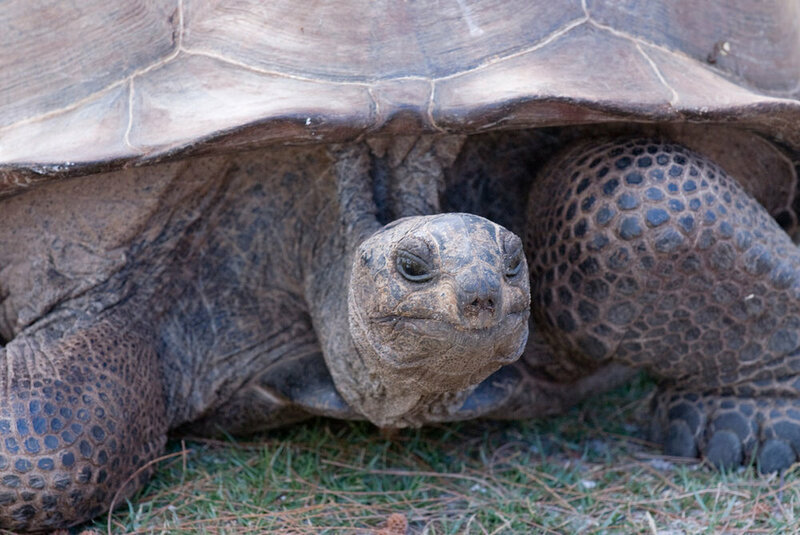 Spot one of the rarest birds and meet the heaviest land tortoise in the world. Marvel at reef sharks and turtles in shallow lagoons. Explore the ‘Jurassic” Valle de Mai with its unique endemic Coco de Mer palms. Stay at gorgeous high-end island resorts and experience the diversity of these islands. For the perfect finish to your Seychelles adventure, join us on our Post Extension to luxurious Alphonse Island, the quintessential island paradise. The Alphonse coral atoll group is considered one of the most pristine, untouched Edens of the world, making it a nature lover’s haven and home to some of the best diving in the Seychelles. 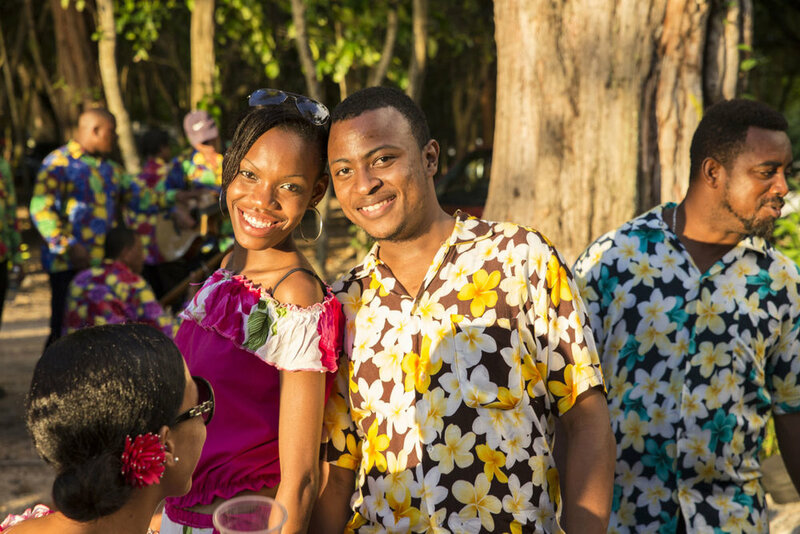 The magnificent island trio comprising of Alphonse, St. Francoise and Bijoutier lies in the very heart of the Indian Ocean as part of the Seychelles outer island group. Join the Island Conservation team on their daily routine, measuring green and hawksbill turtle tracks, tagging turtles and marking new nests; or go birdwatching with one of the islands knowledgeable guides at sunset to see thousands of red-footed boobies returning to roost, as frigate birds wait to harass them. Experience the raw beauty of an untouched natural sanctuary on a tropical island paradise in the far reaches of the Indian Ocean. 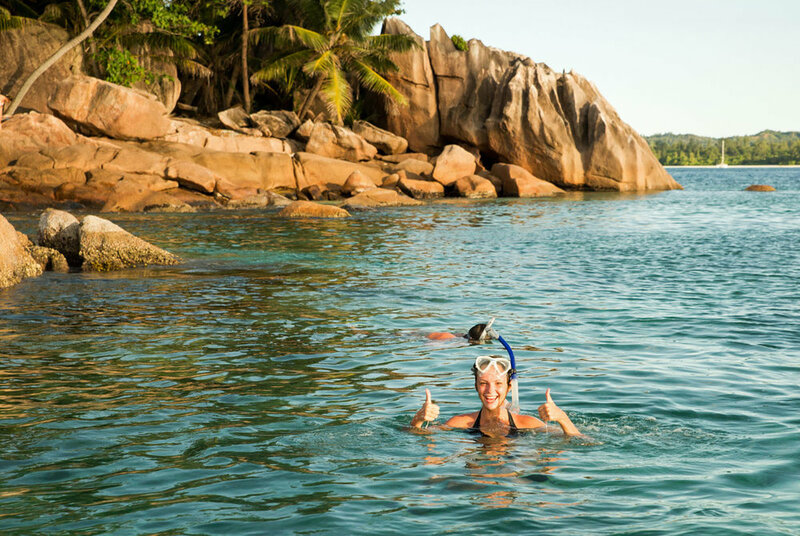 With miles of unblemished shorelines, lagoons, healthy corals, magnificent marine life and sea flats it really has the tropical island feel and is the perfect finish to your Seychelles adventure. 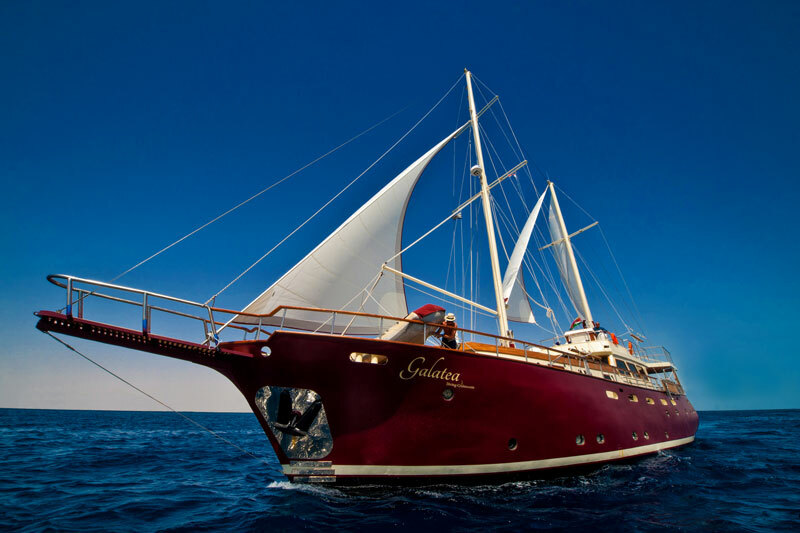 The MS Galatea was built in 1987 and had a full refit in Bodrum, Turkey in 2013. Originally a Turkish steel schooner it was purchased by Blue Sea Divers for the purpose to extend their range and offer diving cruises around the Seychelles. With an overall length of 30 meters with diving platform, the vessel has 7 staterooms including 1 spacious Master Suite with a king bed. All other cabins are furnished with a queen bed, en-suite bathroom and a/c (PLEASE NOTE NO TWIN BEDS AVAILABLE). 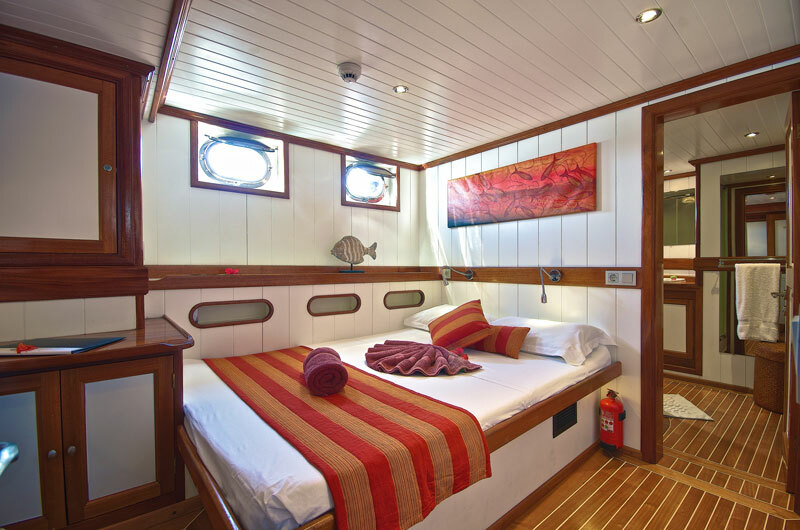 MS Galatea has an outside relaxing area on the top deck with sunbeds, an outdoor dining area and an indoor lounge, as well as the specifically designed dive deck with outside shower and fishing area. The vessel has been specifically designed for cruising, diving, snorkelling and fishing the tropical waters of the Seychelles. The yacht is equipped with the latest safety features including Oxygen, well equipped 1st aid kit, Life Jackets, Fire Extinguishers, Smoke Alarms, and Emergency Long Distance Radios. There is also a kayak and paddle-board available. Nitrox is not available onboard the MS Galatea. Thank you for requesting our 2020 Seychelles Brochure. All accommodations in double share rooms as outlined in the itinerary (twin share not available); Exclusive MS Galatea yacht charter; All group meals; Welcome and farewell cocktail receptions; Soft drinks, drinking water, tea and regular filter coffee during lunch and dinner at all hotels and onboard the MS Galatea; Drinking water in rooms/cabins and while on tours; All group transfers and baggage handling; All tours, excursions, diving and snorkelling as outlined in the itinerary; Exclusive services of English speaking professional guides and naturalists; Services of 2 Wild Earth Expedition Leaders (including Expedition Leader/Dive Guide and Snorkel Guide/Naturalist); All gratuities to porters, guides, drivers, dive crew, ship-, resort- and wait staff; Government- Service- and Room taxes; All permits, Harbour fees, Entrance and Marine park fees; Complimentary photos and videos; Dive tanks/weights for Scuba divers; Donation to marine life conservation project. All international and domestic airfares (please note Domestic charter flight to Alphonse must be purchased through Wild Earth Expeditions and is currently priced at $950 for a return flight); Any airport arrival and departure taxes; Passport and visa fees; Immunization costs; Meals outside the group travel itinerary; Mandatory Travel insurance (including medical, medical evacuation and accident); Personal items, such as laundry, excess baggage charges, any alcoholic beverages or bar charges (unless specified above), WiFi, telephone, fax calls; Tips for your 2 Wild Earth Leaders and any non-group services; Nitrox air fills where available and dive/snorkel gear rental. We only have 1 single space available on this expedition and single occupancy rates apply. Onboard the MS Galatea there is only 1 bed in each cabin (a queen bed apart from Master suite which has a king bed) so you have to share a bed, twin beds (2 beds in one room/cabin) are not available. Same at the Carana Beach, Mahe and also the Hilton Labriz, Silhouette. All rooms at these hotels only offer one king bed as standard. So unfortunately, on this expedition sharing a room/cabin with someone you don’t want to share a bed with is not possible. We apologize for this inconvenience (and also don’t understand why they can’t offer beds that can be separated).